Dairy farms today are already pretty efficient operations; that’s how they’ve been able to survive during periods of low milk prices. 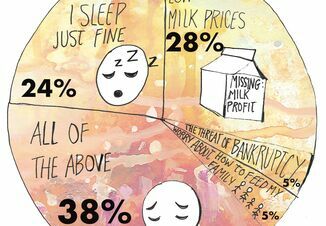 Even so, the current financial situation in the dairy industry makes it especially important to evaluate how we can improve the bottom line by managing the “Big 3”. What are the “Big 3”? These are the largest costs on a dairy farm. They are in order of expense: Feed, Labor, and Heifers. By managing these we can improve the bottom line. Therefore, the purpose of this report is to address ways to increase profits through reducing costs. Feed is the single largest cost on the dairy farm. Accounting for more than 50% of the milk check. Making better quality forage is the most important way to address feed costs. Harvesting better quality forages will reduce purchase feed costs. When we buy feed from a mill we buy a supplement. Question- What are we supplementing? Answer- The nutrient deficiencies in the forage primarily protein and energy. How can we reduce feed cost? By harvesting grasses at the preboot stage and legumes at the 1/10 bloom stage. Recently, an article recommending monthly harvest regardless of the stage of maturity. While this will increase labor and reduce individual harvest yields it will result in higher energy and higher protein forage. Resulting in decreased feed costs. Of course silage needs to be packed adequately, covered and removed with an even face. Also, research from UNH’s own Dr. Andre Brito has shown that cutting forage late in the day will result in more sugars in the forage again resulting in a higher energy forage and a decreased need for supplemental grain (corn). Recommendations for corn silage have producers chopping at a height of 12-18 inches. This is because most of the fiber is located at the base of the stalk while the energy will be in the leaves and ears which will now make up a greater proportion of the crop. This too will reduce supplement costs. Other details in feeding that should be considered is grouping. One group TMR’s should be a thing of the past. While supplementing rumen protected fat and rumen protected amino acids are important and should be fed to high group cows they are unnecessary for mid to late lactation cows. I would not remove items like this from high producers, but I question their importance in mid and low producer rations. Make sure cows have adequate bunk space- lactating cows need at least 24 inches. Also, data observations from local ag lenders indicate that feeding cows twice a day increases milk yield. This practice along with pushing up feed at least 5-6 times per day should increase yield. Consider limit feeding heifers (see our previous post on this topic). This will reduce feed usage, and reduce labor. How much labor a dairy has can make or break profitability. 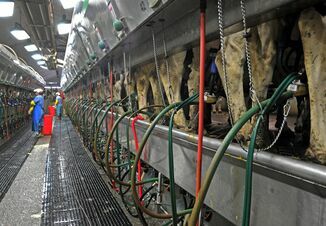 Many dairy farms have too many employees. 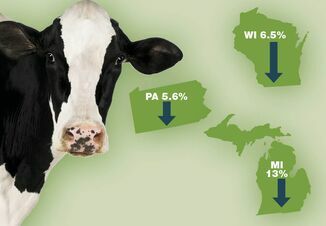 Northeast benchmarks for milk production is 1.2 million pounds of milk per full-time equivalent (FTE) per year or 1 employee per 50 cows (not heifers or calves). Where did the 1.2 million pounds of milk come from? Let’s say your herd’s average milk is 22,000 pounds . That means the herd should be about 55 cows in size. If you have more milk per FTE or more cows per FTE then you are more efficient. Be careful not to overdo it all employees need some time off . When considering FTE, you must consider all employees including part-timers. That means the calf feeder on Sundays or the evening milker on Saturday. These people contribute to the farm, and to the farm’s labor force. Heifers can be a huge cost to the dairy. It costs close to $2300 to raise a heifer in the Northeast. Unfortunately, most dairy farms have too many heifers. Goals for heifers should be that they calve in at 22 months of age, and produce 80% of the milk of mature cows in their first lactation. Calculating heifer needs is easy. Follow the following equation: You need your herd size (A), cull rate percentage (B) and age at calving in months (C) and mortality rate percentage (D). This equation works for herds of static herd size not if you are expanding. Number of heifers needed = (A × B/100) × C/24) × 2 = Y Now adjust for mortality rate = (Y × D/100) + Y = total number of heifers needed on your farm. Example let’s say we have 100 cows with a 30% cull rate an age of freshening of 24 months and a heifer mortality rate of 10% (U.S. average) . (60 × 10/100) + 60 = heifers needed = 66. By reducing age of freshening and reducing mortality less heifers will be needed thereby reducing costs (including feed and labor). For example by reducing age of freshening to 22 months and decreasing mortality to 5%. Heifers needed now becomes 58 a reduction of 8 heifers at a savings of $18,400 over two years ($ 2,300 × 8). Which heifers do I cull? All calves that are born should have a serum protein test to determine passive immunity- calves that do not reach 5.5 should be culled. Calves that do not gain in the first two months (some researchers suggest that their birth weight should double) I am not that restrictive. Calves that suffer from illness especially upper respiratory disease will always be poor doers and should be culled. If you wait until breeding any heifer that takes more than 3 times to breed should be culled. Consider following these recommendations some will yield results almost immediately such as too much labor, others will take some time such as harvesting changes and grouping. These adaptations will help producers “weather the storm” in these difficult times.